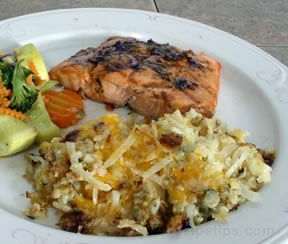 The addition of blue cheese to this common recipe gives it an interesting twist. A perfect side dish. 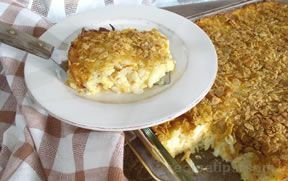 In a large bowl, combine sour cream, soup, salt, butter, onions, thawed hash browns and cheddar cheese. 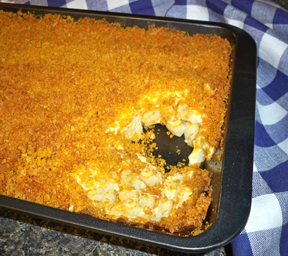 Pour this mixture into a prepared baking dish and sprinkle with blue cheese crumbles. 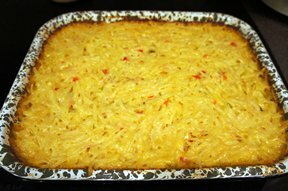 In a small bowl, combine crushed corn flakes and melted butter. Sprinkle corn flake mixture over crumbled blue cheese. Bake at 350Âº F for 45 to 50 minutes, uncovered.